The weather outside is lovely, these days, and we’re trying to spend as much time out there as humanly possible. If you’re looking to join us, here are some fun options. 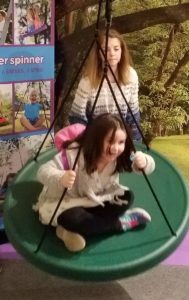 A fun twist on the tire tree swing, the Super Spinner is a “UFO shaped” (according to one 10-year old) disk swing that lets one or more kids (and even a parent) take a ride. Its “adjustable double-braided ropes and weather-resistant clips are designed for a safer, more comfortable ride,” according to the manufacturer. Super Spinner can be suspended to swing and spin from trees, play sets, a porch beam or any other secure structural beam that works for your family. There are two sizes of Super Spinner available. The original can accommodate one or two little kids, and can hold up to 200 pounds. It’s available in green, blue, red, purple, pink, or yellow. The larger, Super Duper Spinner lets more kids and adults ride, and can hold up to 650 pounds. It’s available only in hunter green. $49.99 to $89.99, at stores like Amazon or Target. This entry was posted in Reviews and tagged brooks, intex, seirus, super spinner on July 13, 2018 by Parents@Play Team. While you may have sworn that you’d never, ever sound like your mother (or father), you can probably hear their voices when you shout “reminders” to your kids to put a coat on as they streak out the door. 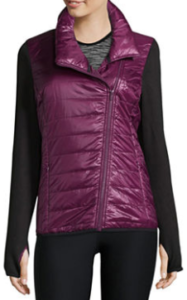 Here’s some great winter gear that’ll satisfy even the pickiest grandparents (and parents, of course). This entry was posted in Reviews and tagged brooks, craghopper, dare 2b, jc penny, perry ellis on January 26, 2018 by Parents@Play Team.